- This is the last week for public comment on the Draft Maryland Avenue SW Plan by the DC Office of Planning. I wrote a summary of the draft plan back in December if you'd prefer to read that instead of the full plan. In addition, there will be a mayoral hearing on February 1st at 6:30pm at 1100 4th Street (2nd floor meeting room) to receive testimony on the plan. - The Capital Comment Blog at Washingtonian Magazine interviewed Daniel J. Feil, executive architect of the Eisenhower Memorial Commission, who defended the Gehry design of the planned memorial to President Eisenhower in response to a recent interview by the same blog of Eisenhower's granddaughter (Susan Eisenhower), who was critical of the design. The proposed memorial will be located across the street from the National Air & Space Museum, bounded by Independence Avenue to the north, 4th Street to the east, the Department of Education headquarters to the south, and 6th Street to the west. The memorial commission will go before the National Capital Planning Commission on March 1 to get preliminary design approval and hopes to have construction underway by the end of the year. - NBC4 reports that there was a stairwell collapse this evening at an apartment building on the 4300 block of Martin Luther King Jr. Avenue in Bellevue. According to the news story, a delivery person was carrying a large piece of furniture when the stairway gave way. The delivery person sustained serious injuries and was taken to Howard University hospital. It’s a testament to the skills of director Robert Falls that he achieves the seemingly impossible in, currently playing at Arena Stage—he makes spellbinding theater out of watching paint dry. ...To say that art, and one man’s tricky, impenetrable understanding of it, is at the heart of which is co-presented by Arena Stage and Chicago’s Goodman Theatre and arrives here after a well-received Chicago run is an understatement. John Logan’s Tony-winning 2009 play is a fascinating look at the dogmatic, unyielding vision of Rothko, whose paintings (presumably to his chagrin) adorn the walls of endless college dorm rooms and major art galleries alike...For such a short (100 minutes) and focused play, Red manages to cover a surprising number of bases. 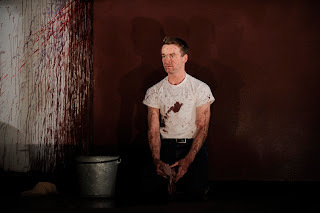 Rothko’s relationship with Ken, a fictional character invented by Logan to explore the artist’s character, is initially one-sided, but as the play shifts towards its inevitable, almost Oedipal conclusion, Ken’s character takes on a new grittiness, reflecting his mentor. At the play’s start, Andrews is all two-dimensional Richie Cunningham earnestness and Converse sneakers, but as Ken’s tragic past unfolds, the character takes on a new steeliness, with Andrews resisting the temptation to make Ken just a foil for Rothko’s grim self-absorption. RED will run at Arena Stage until March 11.